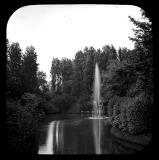 Adams Clock tower, Tunstall Park. The footpath passing through allotment gardens between Kendrick Street and Meir Hay. Note the clinkers, saggars and bricks which make up the walls. Alton Castle, Formal Gardens and Buildings, Alton. Photographed by William Blake. Alton Castle. Photographed by William Blake. View of Alton Castle, showing part of the wall and towers from the medieval castle built in about 1175. Landscape with a view of Alton castle, Staffordshire. View of Alton Castle showing the south-east angle of the tower and wall. Alton. Photographed by William Blake. Axe Edge, neer Leek. Photographed by William Blake. A view of Axe Edge and the Leek-Buxton road. This area lies within the Peak District National Park. The image is one of a series labelled "Leek & Buxton". Beeston Tor. Photographed by William Blake. Landscape taken at Dovedale, Derbyshire. This area is now part of the Peak District National Park. Landscape taken at Manifold Valley, Staffordshire. The geological landmark known as Beeston Tor can be seen in the background. This area is now part of the Peak District National Park. Biddulph Grange Gardens. Photographed by William Blake. 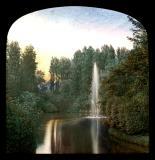 Stereoscope slide with a view of the ornamental gardens and Chinese Temple at Biddulph Grange, Nr. Stoke-on-Trent, Staffordshire.